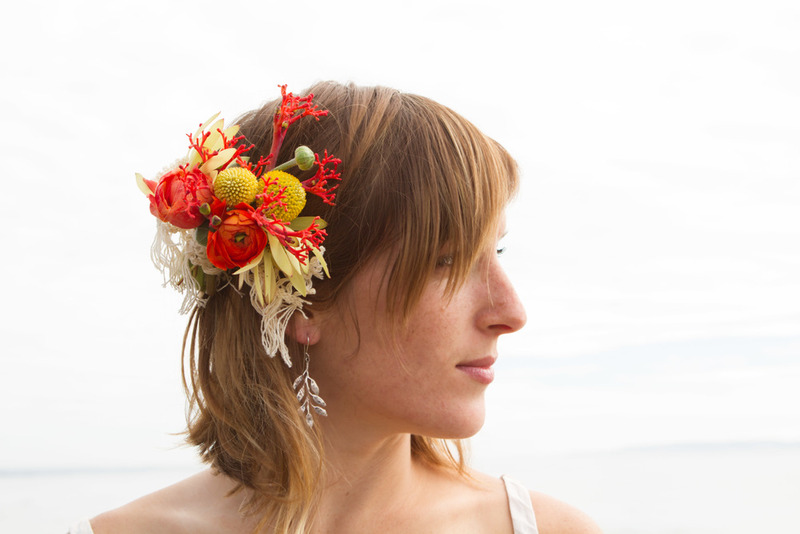 Faith Dickey modeling a floral hairpiece featuring orange ranunculus, coral flower and a few other choice picks. Every so often in life our passions manage to intersect with those with like minds and hearts. Kindred spirits we sometimes call them, but whatever title or category you choose to put things in, sometimes you see the fire glowing within another person and you want to be a part of it at least in some small way. Through mutual friends, I came in contact with Faith Dickey and Andrew Craig who are two passionate slack liners and Faith is a professional and world record holder in the field. Slack lining is the practice of balancing on a a suspended line between two anchor points. High lining is taking that same phenomenon to a higher, much more dangerous level, spanning mountainous peaks, trees, rocks, or anything else your mind can fathom and safely anchor a line to. Faith crosses the line over Avila Beach in Pismo onwards to Andrew awaiting her. I knew immediately that I would love to do something involving this somewhat nascent sport and with some minor encouraging to my photographer friend, J.R. Racine, we made the connection and made this shoot happen. I cannot thank Andrew and Faith enough for spending the day with us and making this beautiful shoot happen. 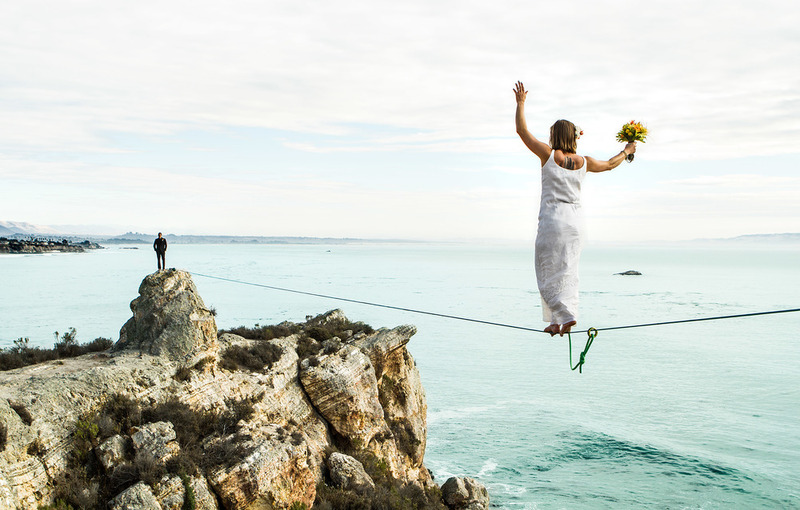 They are both so focused, determined, talented (not to mention good looking), and it was a treat to once again get to experience their craft with the added bonus of a little dress up for the conceptual slack line wedding. For more photos from the shoot, please click the link below to the Highline Wedding Shoot.